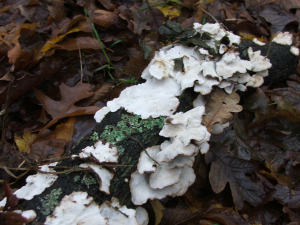 Observation - Turkeytail (Trametes versicolor) - UK and Ireland. Description: I think this is T.versicolor in it's early stages, hence the white upperside. Although, the zoned banding is clearly visible on the underside. This is a very variable species. I think this is T.versicolor in it's early stages, hence the white upperside. Although, the zoned banding is clearly visible on the underside. This is a very variable species.